I could eat roasted veggies any day, especially if there’s cumin added! I also love hummus and in this dish it makes the perfect sauce. These veggies are also really versatile, they can be enjoyed as a light vegetarian meal or as a side dish with roasted chicken. Use them in any salad or stir into couscous and a handful or two of fresh rocket, coriander, basil leaves and roasted nuts. These are great at room temperature as part of a lunch box or delicious on pizzas or in sandwiches. 1. Preheat the oven to 180 °C. Line a large baking tray (or two smaller trays) with baking paper. Make sure that the veggies are all cut into similar-sized pieces, as this will help them cook evenly. 2. Place veggies in a single layer on the baking paper and sprinkle pumpkin and cumin seeds over them. Mix vinegar and oil together and pour over the veggies. Season to taste. 3. Roast for 45-50 minutes or until the veggies are soft and golden brown. Stir through once during the cooking time. Allow to cool. 4. Sauce: Mix all the sauce ingredients together and season to taste. 5. Gently mix parsley and rocket into the veggies. Serve at room temperature with spoonfuls of the sauce. 1. Substitute hummus and oil with 45 ml (3 tbsp) pesto of your choice. Alternatively, stir harissa paste into the yoghurt, but add to taste. 2. 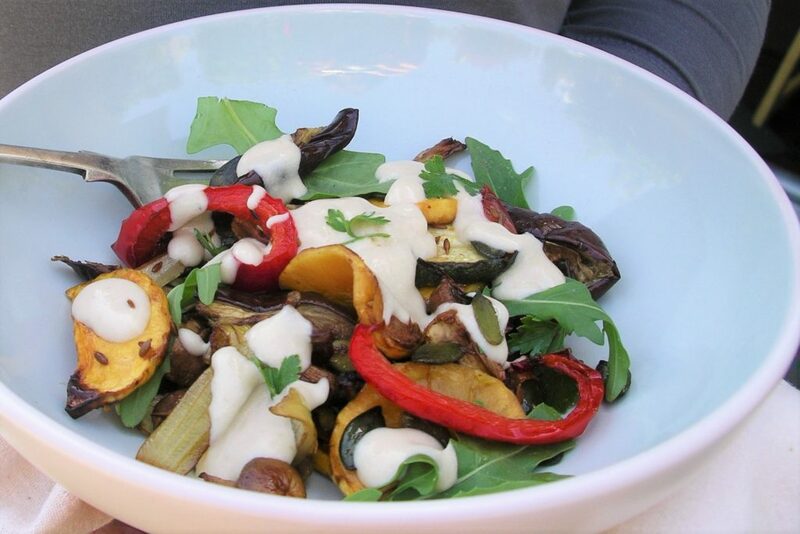 If you want a thicker sauce – omit the yoghurt. Use 250 ml (1 cup) hummus with 60 ml (¼ cup) avocado or olive oil. 3. Add cooked chicken or chickpeas to the veggies for a more filling meal. The chickpeas can be roasted with the veggies for a delicious flavour – just add them to the veggies in the last 20 minutes of the cooking time.